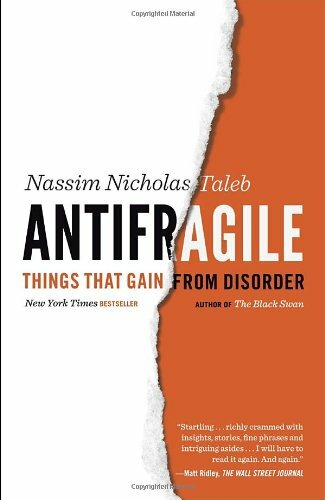 Blog / Book Notes: "Antifragile"
Did you ever wonder why heads of state and very rich people with access to all this medical care die just as easily as regular persons? Well, it looks like this is because of overmedication and excessive medical care. People are cruel and unfair in the way they confer recognition, so it is best to stay out of that game. This is what Seneca elected to do: he initially had a very active, adventurous life, followed by a philosophical withdrawal to write and meditate, rather than a "middle" combination of both. Many of the "doers" turned "thinkers" like Montaigne have done a serial barbell: pure action, then pure reflection. Indeed, Georges Simenon, one of the most prolific writers of the twentieth century, only wrote sixty days a year, with three hundred days spent "doing nothing." He published more than two hundred novels. The legendary investor Ray Dalio has a rule for someone making speculative bets: "Make sure that the probability of the unacceptable (i.e., the risk of ruin) is nil." Such a rule gets one straight to the barbell. This kind of sum I've called in my vernacular "f*** you money"--a sum large enough to get most, if not all, of the advantages of wealth (the most important one being independence and the ability to only occupy your mind with matters that interest you) but not its side effects, such as having to attend a black-tie charity event and being forced to listen to polite exposition of a marble-rich house renovation. Financial independence, when used intelligently, can make you robust; it gives you options and allows you to make the right choices. Freedom is the ultimate option. "If the student is smart, the teacher takes the credit." These illusions of contribution result largely from confirmation fallacies: in addition to the sad fact that history belongs to those who can write about it (whether winners or losers), a second bias appears, as those who write the accounts can delivery confirmatory facts (what has worked) but not a complete picture of what has worked and what has failed. Recall the quote by Seneca and Ovid to the effect that sophistication is born of need, and success of difficulties--in fact many such variations, sourced in medieval days (such as necessitas magistra in Erasmus), found their way into our daily vernaculars, as in "necessity is the mother of invention." Likewise, in ancient times, learning was for learning's sake, to make someone a good person, worth talking to, not to increase the stock of gold in the city's heavily guarded coffers. Entrepreneurs, particularly those in technical jobs, are not necessarily the best people to have dinner with. People with too much smoke and complicated tricks and methods in their brains start missing elementary, very elementary thing. Persons in the real world can't afford to miss these things; otherwise they crash the plane. Unlike researchers, they were selected for survival, not complications. So I saw the less is more in action: the more studies, the less obvious elementary but fundamental things become; activity, on the other hand, strips things to their simplest possible model. Practitioners don't write; they do. Birds fly and those who lecture them are the ones who write their story. So it is easy to see that history is truly written by lowers with time on their hands and a protected academic position. The sociologist of science Steve Shapin, who spent time in California observing venture capitalists, reports that investors tend to back entrepreneurs, not ideas...Why? Because innovations drift, and one needs flaneur-like abilities to keep capturing the opportunities that arise, not stay locked up in a bureaucratic mold. William Starbuck, has published a few papers debunking the effectiveness of planning--it makes the corporation option-blind, as it gets locked into a non-opportunistic course of action. We accept the domain-specificity of games, the fact that they do not really train you for life, that there are severe losses in translation. But we find it hard to apply this lesson to technical skills acquired in schools, that is, to accept the crucial fact that what is picked up in the classroom stays largely in the classroom. But the problem is more general; soccer moms try to eliminate the trial and error, the antifragility, from the children's lives, move them away from the ecological and transform them into nerds working on preexisting (soccer-mom compatible) maps of reality. Provided that we have the right type of rigor, we need randomness, mess, adventures, uncertainty, self-discovery, near-traumatic episodes, all these things that make life worth living, compared to the structured, fake, and ineffective life on an empty-suit CEO with a preset schedule and an alarm clock. The education system is broken. Too much focus on getting good grades and passing exams. You are often forced to study and read books you have no interest in. As a result, you forget most of things you studied, making most of that time spent in school a waste of time. Many students graduate unprepared for the real world. One day in the 1980s I had dinner with a famous speculator, a hugely successful man. He muttered the hyperbole that hit home: "much of what other people know isn't worth knowing." The payoff, what happens to you (the benefits or harm from it), is always the most important thing, not the event itself. Education is an institution that has been growing without external stressors; eventually the thing will collapse. The interpretation I had in the past was that a psychological bias, the underestimation of the random structure of the world, was the cause behind such underestimation--projects take longer than planned because the estimates are too optimistic. We are prone to make more severe errors because we are simply wealthier. Just as projects of one hundred million dollars are more unpredictable and more likely to incur overruns than five-million-dollar ones, simply by being richer, the world is troubled with additional unpredictability and fragility...Even at an individual level, wealth means more headaches; we may need to work harder at mitigating the complications arising from wealth than we do at acquiring it. Michaelangelo was asked by the pope about the secret of hist genius, particularly how he carved the status of David, largely considered the masterpiece of all masterpieces. HIs answer was: "It's simple. I just remove everything that is not David." The reader might thus recognize the logic behind the barbell. Remember from the logic of the barbell that it is necessary to first remove fragilities. Yet in practice it is the negative that's used by the pros, those selected by evolution: chess grandmasters usually win by not losing; people become rich by not going bust (particularly when others do); religions are mostly our interdicts, the learning of life is about what to avoid. Rephrasing it again: since one small observation can disprove a statement, while millions can hardly confirm it, disconfirmation is more rigorous than confirmation. And, as expected, via negativa is part of classical wisdom. For the Arab scholar and religious leader Ali Bin Abi-Taleb (no relation), keeping one's distance from an ignorant person is equivalent to keeping company with a wise man. Steve Jobs: "People think focus means saying yes to the thing you've got to focus on. But that's not what it means at all. It means saying no to the hundred other good ideas that there are. You have to pick carefully. I'm actually as proud of the things we haven't done as I have done. Innovation is saying no to 1,000 things." Accordingly, as I will show, 1 percent modification of systems can lower fragility (or increase antifragility) by about 99 percent--and all it takes is a few steps, very few steps, often at low cost, to make things better and safer. For the perishable, every additional day in its life translates into a shorter life expectancy. For the nonperishable, every additional day may imply a longer life expectancy. So the longer a technology lives, the longer it can be expected to live. So I follow the Lindy effect as a guide in selecting what to read: books that have been around for ten years will be around for ten more, books that have been around for two millennia should be around for quite a bit of time, and so forth. Corporations that are large today should be gone, as they have always been weakened by what they think is their strength: size, which is the enemy of corporations as it causes disproportionate fragility to Black Swans. If you are antifragile (i.e., convex) to a given substance, then you are better off having it randomly distributed, rather than provided steadily. We know we can cure many cases of diabetes by putting people on a very strict starvation-style diet, shocking their system--in fact the mechanism had to have been heuristically for a long time since there are institutes and sanatoria for curative starvation in Siberia. As for liquid, my rule is drink no liquid that is not at least a thousand years old--so its fitness has been tested. I drink just wine, water, and coffee. If you take risks and face your fate with dignity, there is nothing you can do that makes you small; if you don't take risks, there is nothing you can do that makes you grand, nothing. And when you take risks, insults by half-men (small men, those who don't risk anything) are similar to barks by nonhuman animals: you can't feel insulted by a dog. Never ask anyone for their opinion, forecast, or recommendation. Just ask them what they have--or don't have--in their portfolio. The psychologist Gerd Gigerenzer has a simple heuristic. Never ask the doctor what you should do. Ask him what he would do if he were in your place. You would be surprised by the difference. So the antifragile can lose for a long time with impunity, so long as he happens to be right once; for the fragile, a single loss can be terminal. Playing on one's inner agency problem can go beyond symmetry: give soldiers no options and see how antifragile they can get. Never put your enemy's back to the wall. Never listen to a leftist who does not give away his fortune or does not live the exact lifestyle he wants others to follow. In addition, my experience of company executives, as evidenced by their appetite for spending thousands of hours in dull meetings or reading bad memos, is that they cannot possibly be remarkably bright. They are no entrepreneurs--just actors, slick actors (business schools are more like acting schools). But he left us with a good lesson: never trust the words of a man who is not free. Comparing a civil servant's promise to a mobster's (the mobster is more likely to honor his words). "But, Neeroh Toolip, there are still slaves around," Fat Tony blurted out. "They often distinguish themselves by wearing this intricate device called a necktie." There is a phenomenon called the treadmill effect, similar to what we saw with neomania: you need to make more to stay in the same place. Greed is antifragile--though not its victims. A the local level, it looks like we get socialized in a certain milieu, hence exposed to a treadmill. You do better, move to Greenwich, Connecticut, then become a pauper next to a twenty-million-dollar mansion and million-dollar birthday parties. And you become more and more dependent on your job, particularly as your neighbors get big tax-sponsored Wall Street bonuses. Innovation is precisely something that gains from uncertainty: and some people sit around waiting for uncertainty and using it as raw material, just like our ancestral hunters.